Hi everyone, have you ever wondered how I do it all? How I homeschool, work from home, and keep up with daily life? Well, I think the last time I posted about what my daily schedule looks like it was about 4 years ago, so I thought maybe it was time for an update! While each day can bring on a chaos of its own, we do have a basic routine that we try to stick to. Obviously things don’t always run smoothly around here, and some days are crazier than others. But I like to at least have a basic guideline to get me through the day and today I’ll be sharing that with you. 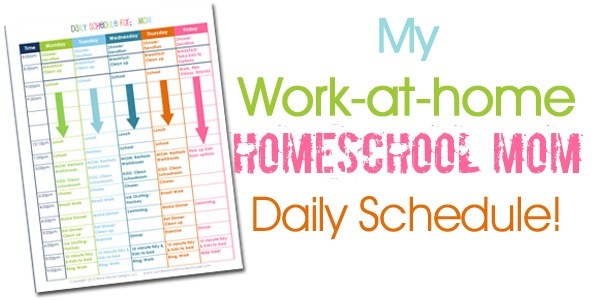 Check out my Updated Homeschooling/Work-at-Home Daily Schedule here! As most of you already know, we homeschool. For our family that is my full time job, and I do my best to focus solely on school during those hours. I stay off the computer, email, and phone during those times. And focus my energy on being available to teach and help my kids during school time. I also work from home on my blog, creating YouTube content, and I create homeschool curriculum as well as free printables. Those all take up quite a bit of time, so without some planning I’d never be able to get those things done! I try to view that as a part-time job and have to strategically plan work time into my day as well. One thing that has helped tremendously was using a traditional daily planner. I’m using my Life Planner right now because it helps me keep track of regular household chores, our family commitments, things to do/buy, reminders, etc. I have a separate planner for my blog, YouTube, social media, idea lists, new projects etc. I find that I prefer having separate planners for work and home life. I also use my iPhone as well because it physically beeps to remind me that I need to be somewhere, or do something. But I realized that I still really like to see things all laid out in front of me and I find that once things get put in my phone they disappear from my brain. So having them written out has really helped me literally “see” what I have to do each day and week. That said, here’s what my ideal schedule looks like. Here is our schedule in a little more detail….basically…provided nothing unexpected happens…like life. 9:00 am – SCHOOL STARTS! Noon – We usually break for lunch around noon-ish, then finish our group studies like history, geography, art, etc. after lunch. 2:00 pm – SCHOOL ENDS! (Well you know, technically it ends…realistically my kids are subject to my constant pop quizzes all day long.) At the end of each day I re-fill workboxes while the kiddos clean up their areas and make sure the school room is all nice and pretty like it was when we started. 3:00 pm – I usually work during this time, check email, blog, etc. The kids get some free time. 4:30-6:30 pm – Dinner Prep, Eat, and kitchen clean up. Some nights we have sports, so we work our dinner around those. 6:30pm – Dad enters & asks “So, what did you do all day?” I say “Not much, just lounged around and ate bon-bons.” Dad quizzes kids to make sure I’m kidding. 7:00 pm – I usually try to exercise or go on a walk during the calm between dinner and bedtime. I find that it helps my mental state tremendously to get out and get some fresh air! When it’s too cold, I hit our elliptical trainer, however I usually get bored on it. 9:00 pm: Free time for mom and dad….sit down for first time today and sigh…and praise God we made it through another homeschool day without burning down the house! More help for this working mama: I hired my mom as a virtual assistant to help me out with some of my administrative stuff like answering emails. She’s also taken over shipping orders as well. So if you email to get your links reset you’ll most likely hear back from her! Thanks mom! I couldn’t do it without you! Grocery Shopping: I usually end up going to the store on the weekends, but if we have a time I will try to go on Mondays instead since it’s less crowded! But that doesn’t always work out, so I try to be flexible. Household Cleaning: On the weekends we all share the work and do an overall house cleaning. That includes dusting, vacuuming, moping, bathrooms, kitchen, etc. Everyone get’s 1-2 jobs which makes it go quickly! Since we all work together we can usually clean our whole house in about 1 hour, then we have the rest of the weekend to chill out and have fun! I’ve also had to relax a little bit in this area. Since we homeschool, our house just gets lived in. It’s all about being flexible when you have four children and homeschool! 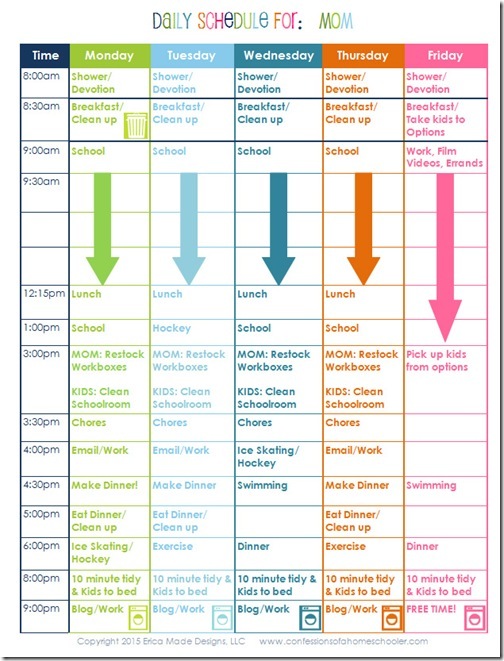 Sports: With four kids, we have a lot of extra curricular activities during the week. We try to keep the house house mostly tidy all week long, so on the weekends we can relax and enjoy them. Free Time: As crazy as our week can get, I like to try and get done with cleaning first, so that everyone can just hang out and relax on the weekends. That’s when we schedule play dates, have family game nights, etc. And that’s usually when I have time to sew, quilt, and read too! Everyone needs a little downtime. While it’s difficult to do during school time, a little break here and there can do a world of good! Work: I work a few hours each day during the week and then I usually try to take Saturday off. Work includes catching up on emails, writing new blog posts, filming videos, and working behind the scenes on things like writing books and creating curriculum. Hope this helps answer some of your questions about our daily schedule. I would just like to encourage you to be flexible and fit your daily schedule around your unique needs. That’s one of the things that makes homeschooling so amazing! Thanks for the update Erica! In your video you mentioned showering in the morning. Is this the same for your kids as well or do they shower at night? I don’t have a set amount, we sprinkle them in through the year wherever they make sense based on what we’re studying and what field trips are avail. 🙂 Weekly would be too much for me! Your organization is inspiring to the rest of us! I enjoyed looking at your products on your website. Happy New Year! Loved this!! My oldest graduated 2 years ago, but I still homeschool my 8th grader and out bonus blessing 1st grader 🙂 It can get crazy, but I can attest to the fact that is does get easier as they get older! I never would’ve imagined I would graduate my oldest. Blessings to you! How old are your children? do u do nap time? They are in 3rd, 6th, 8th, and 9th grades now. We do not do naptime 🙂 For prek I usually suggest 1-2 hours per day as well depending on what your child can handle without getting frustrated. How do you go about finding out about the options program at an Elementary school? You are absolutely amazing! I wish I was as talented, organized and devoted. We are on our second year of homeschooling. Last year was on purpose (many reasons). This year both they (two kids, ages 11 and 13) and their father wanted them to go back to their previous (private) school. It didn’t work out, they were full. I see it as a sign. So I’m late in the game figuring our new purchases. Last year was all teacher lead. This year we are looking into more individualized and independence. Your posts/videos have been most helpful! I still feel a little lost and feel resistance from my oldest (son), but my goal to have them enjoy it, plus learn! With all that, THANK YOU! With a senior this year and a 7th grader I am feeling so overwhelmed! Definitely need to a bit more structure to our crazy days and a reminder that we can all share the load so this momma doesn’t lose it completely! Love how organized you are! What are the options or extra classes of your 4th grader?